On Thanksgiving Day, Thursday, November 23, 2017, in New York City, the 91st Macy’s Thanksgiving Day Parade will delight the millions of people who watch either the NBC broadcast or via Live Steam. The parade will start at 9 a.m., Eastern Time, at the corner of Central Park West and 77th Street and proceed downtown along a 2.5-mile route, to Columbus Circle, then along Central Park South to 6th Avenue, down 6th Avenue to 34th Street, then finally along 34th Street to Macy’s Herald Square (34th Street). This continues a tradition that started back in the 1920s, when America’s doors were wide open and millions of immigrants passed through Ellis Island. Many Macy’s employees were first generation immigrants, proud of being new Americans and wanting to celebrate an American holiday with the kind of festivals they’d known in Europe. 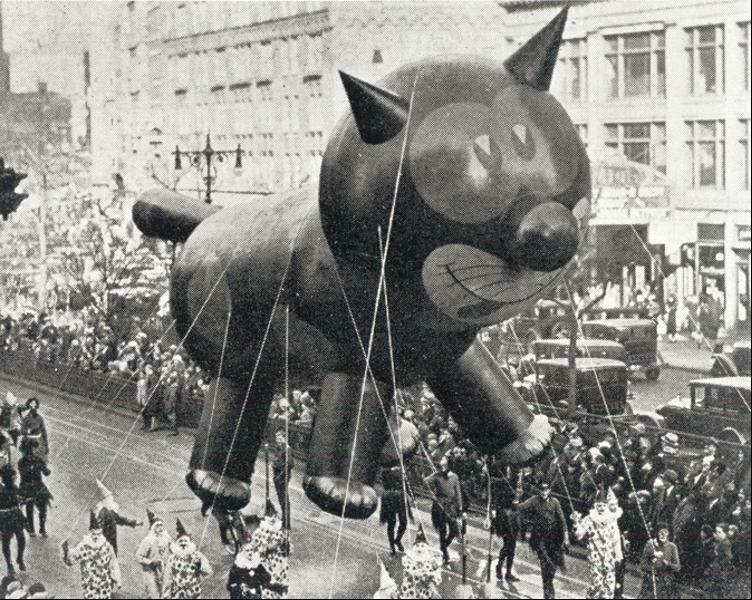 The original Felix the Cat Balloon. This year’s line-up will feature 17 giant character balloons; 28 legacy balloons, balloonicles, balloonheads and trycaloons; 26 floats; 1,100 cheerleaders and dancers; more than 1,000 clowns; 12 marching bands and six performance groups. 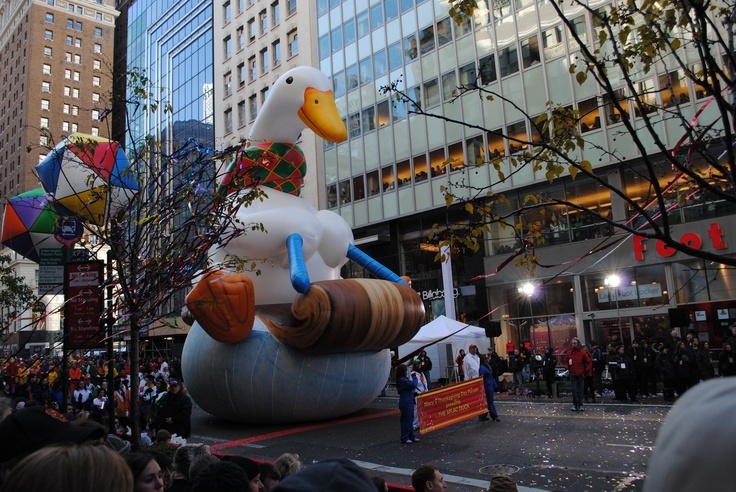 This original version of the Aflac Duck made its debut in 2011. As always, there will be new balloons, including Super Wings’ Jett, Frozen’s Olaf, PAW Patrol’s Chase, Harold the Baseball Player, Macy’s Golden Snowflake Stars and the third version of the Aflac Duck (the original version debuted in 2011). This year’s new floats include Everyone’s Favorite Bake Shop by Entenmann’s, Harvest in the Valley by Green Giant, Parade Day Mischief by Sour Patch Kids Candy, Shimmer and Shine by Nickelodeon and Universal Playground by Sprout. 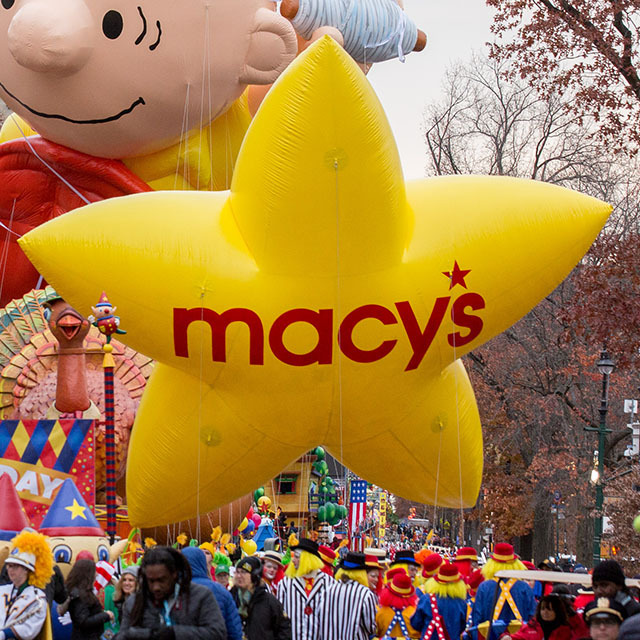 A surprise float sponsored by Macy’s will debut this year. It will stand over 30 feet tall and feature more than 100 Macy’s employees from around the country who will sing during the parade. From pop singers to hip hop stars and a boy band, the parade will feature lots of talent, including Sabrina Carpenter, Nicky Jam, Lauren Alaina, Bebe Rexha, Angelica Hale, Tom Colicchio, Padma Lakshmi, Leslie Odom Jr., Miss America Cara Mund, Whoopi Goldberg, Olivia Holt, Wyclef Jean, Dustin Lynch, Harry Connick Jr., Andra Day, Sara Evans, Andy Grammer, Smokey Robinson, Jimmy Fallon, the Radio City Rockettes and 98 Degrees. Inflation of the balloons, which has become a popular spectator event on its own, happens the day before, November 22nd, starting at 1 p.m. and continuing until 8 p.m. This year there will be 25 parade balloons. 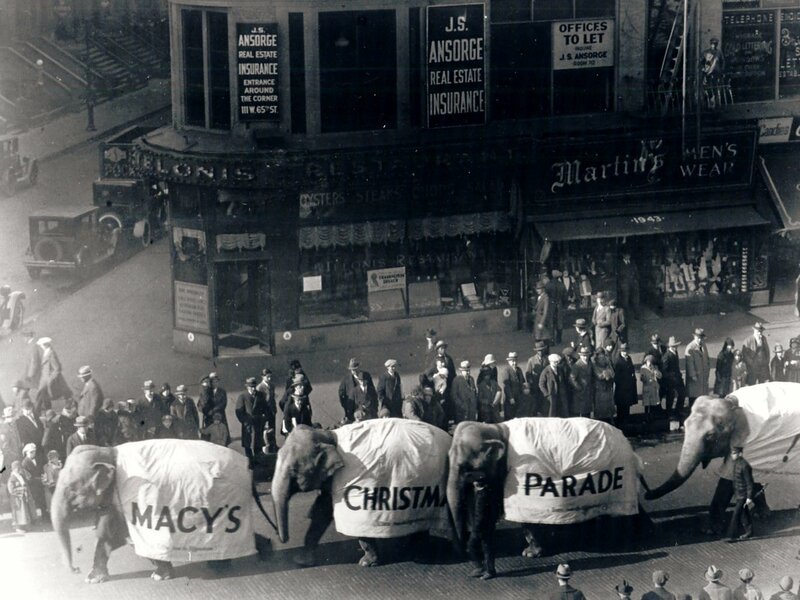 The first parade in 1924 was called the Macy’s Christmas Day Parade, although it took place on Thanksgiving Day. If you laid every parade balloon since 1927 end to end, they would stretch from Battery Park City to the Cloisters and beyond.